Happy Smoke Day! 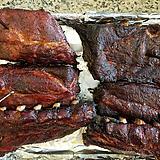 I'm not able to BBQ this weekend but I've been using my 18" WSM like crazy the last few weeks, so for Smoke Day 2018 I'm posting my last few cooks from this month; 1) ribs hung vertically, 2) carne asada/adobada tacos, and 3) pizza. 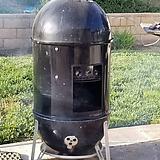 For the ribs, I recently bought a rib hanger kit from gatewaydrumsmokers.com and better hooks and other gucci stuff from pitbarrelcooker.com. I LOVE cooking ribs this way because I can easily fit many racks into the 18" smoker and they seem to cook a little faster. 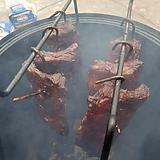 I had to be careful about not leaving the lid open too long since the fire flares quicker without the water pan. 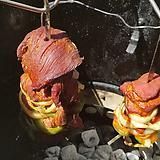 I also used the hanger kit to hang skewers of carne and adobada for tacos, which also turned out awesome! 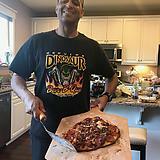 For the pizza, my sister came over with an electric pizza cooker so I decided to see if it could cook as well as my WSM. I had bever cooked pizza before though, so it was somewhat experimental. 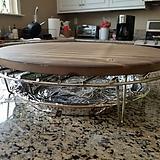 I used the article on this website as a model (http://virtualweberbullet.com/baking.html) then setup a rig using a pie pan and raised grate. 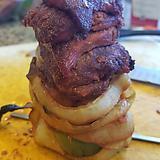 I moved the coals from the bottom to the top of the WSM and bought a thermometer that would work at 550 degrees. Toppings were pepperoni, italian sausage, oregano, and lightly-sauteed jalapeno/green chilis/onion so the crust doesn't get soggy. My first pizza was undercooked in the middle so I removed the pie pan, my second pizza turned out AWESOME, then I burned my third pizza. I think my pizza stone wasn't up to temp yet for the first two pizzas; it looks like I need to wait an extra while after my smoker's ready before I add the pizza. A series of great cooks! 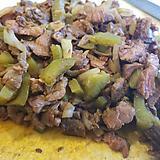 JFlow - your pics are good, and your enthusiasm even better - those hangy taco meat things look like the goods! keep it up! Looks like you had a couple of nice cooks going. I really like your pizza story!